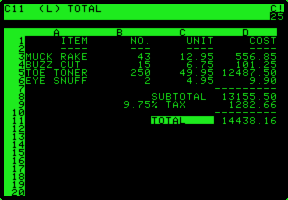 VisiCalc, the first spreadsheet, was one of the key products that helped bring the microcomputer from the hobbyist’s desk into the office. Before the release of this groundbreaking software, microcomputers were thought of as toys; VisiCalc changed that. VisiCalc was first released for the Apple II, which quickly became an invaluable tool for businesspeople – at least until IBM moved into the “personal computing” market in 1981. VisiCalc began at Harvard Business School in 1978. Dan Bricklin was studying for his MBA and was struck by the limitations of a common (paper) spreadsheet. As a professor was giving a lecture, he found an error in a single cell and was forced to change the value in every other cell. Bricklin imagined his pocket calculator (a TI Business Analyst) outfitted with a small trackball, like the mouse demonstrated by Douglas Engelbert several days before at Harvard, and a simple interface that would allow him to create spreadsheets that could be corrected and redone on the fly. Bricklin decided to pursue the idea further and recruited a veteran programmer, Bob Frankston, to turn his fantasy into a real program. Dan Fylstra, head of Personal Software, a pioneering software publisher, took an early interest in the concept. He managed to convince Bricklin to write VisiCalc for the Apple II instead of the DEC minicomputer Bricklin preferred. Bricklin implemented a primitive demo program in Integer BASIC on an Apple II loaned to him by Personal Software. Fylstra selected the Apple II not only because of its technical merits (it had superior graphics to the CP/M microcomputers and many minicomputers) but also because he got a steep discount from Steve Jobs after promising that the popular KIM-1 program, MicroChess, would be ported to the Apple. The VisiCalc demo was rudimentary (a user could not scroll beyond the columns and rows visible on the screen), but it strongly resembled the final product and impressed Fylstra. The program had a set of rows (labeled with numbers) and columns (labeled with letters), and users could enter data or formulas into each cell, and could even address other cells using their names (i.e. A2). Dan Fylstra was so impressed with the demo program that he reached an agreement with Bricklin and Frankston to distribute the final product. The three agreed to 37.5% of all the spreadsheet’s revenues as royalties and a one time advance to cover development costs. Frankston and Bricklin formally incorporated Software Arts, Inc., and began development. Development of the shipping product began in earnest in mid-1978. A special version of the assembly programming language was selected. Developed by John Doty from ECD, a company producing a custom 6502 microcomputer, the language was different from Apple’s assembly language in that it used macros to call previous parts of the program, instead of GOTOs (avoiding “spaghetti” code). The software ran on a minicomputer equipped with the Multics operating system that Frankston had worked with extensively. Frankston briefly considered buying time on a timeshare computer but decided it wouldn’t be practical, so the small company bought its own minicomputer – a huge investment for a small company. Software Arts moved into an attic of a building in Boston where Bricklin had an apartment and set to work. The approach Bricklin and Frankston took to software development was very different from other hobbyists’ projects. They were not making a program exclusively for themselves. Instead, Bricklin, who did the research and design of the product, decided what most users would want in a spreadsheet. An example is labeling, which was included in the original demo. Instead of referring to cells as B2, a user could label an entire row or column, allowing cell names like JUNESALES. Bricklin decided this made it too easy for users to make mistakes when addressing other cells – and it would take up valuable screen real estate (the Apple II had a 40 column screen). Another change was the addition of windows. If a user wanted to work with two different parts of the spreadsheet, he or she could just split the screen and show both parts simultaneously. The Apple II was a difficult platform to develop business software for, and Bob Frankston had to implement several hacks to make VisiCalc usable on it. The keyboard was difficult to use for text entry. If a user typed too fast, characters would be dropped. In order to avoid this, VisiCalc constantly listened to the keyboard, taking up extra resources, but users would never lose characters due to typing too fast. File storage was another problem. Apple’s file system was only available through licenses. They weren’t very expensive, but they left software developers beholden to Apple for their survival. Frankston was leery. He reverse engineered the software and implemented a “clean” file system that didn’t violate Apple’s copyright and was compatible with other Apple programs. The biggest problem for Frankston was the Apple II’s limited memory. No matter how hard he tried, he could not fit VisiCalc in the 16 KB of RAM on the low-end Apple II. VisiCalc would only be available for the much more expensive 32 KB Apple II. The program went on sale in November 1979 and was a big hit. It retailed for US$100 and sold so well that many dealers started bundling the Apple II with VisiCalc. The success of VisiCalc turned Apple into a successful company, selling tens of thousands of the pricey 32 KB Apple IIs to businesses that wanted them only for the spreadsheet. By the end of 1979, IBM took note of the uptick in sales of Apple IIs to businesses and began Project Chess, which would ultimately be released as the IBM PC. In 1981, Software Arts made over $12 million in royalties from VisiCalc. It became Personal Software’s flagship product, financing the groundbreaking VisiOn office suite and GUI. Just before the release of VisiOn, Personal Software was renamed VisiCorp. Dan Bricklin became widely recognized in the computer business for his contributions. He was awarded the White Elephant by industry pioneer Adam Osborne for inventing the electronic spreadsheet. The success wouldn’t last long, though. In 1983, Lotus 1-2-3 was released. It was available exclusively for the IBM PC and other MS-DOS computers, and it quickly outsold VisiCalc. Lotus worked a lot like VisiCalc, which made migration easy, and it took full advantage of the PC’s 80-column display and vast amounts of memory, which allowed much bigger spreadsheets than the Apple II could handle. As competition from Lotus 1-2-3, Microsoft MultiPlan, and countless other developers heated up, tensions developed between VisiCorp and Software Arts. Eventually, VisiCorp sued Software Arts when the company delayed development of VisiCalc for the IBM PC so they could first finish a version for the Apple IIe and III. Software Arts’ assets were eventually sold to Lotus, which unsurprisingly stopped development of VisiCalc.